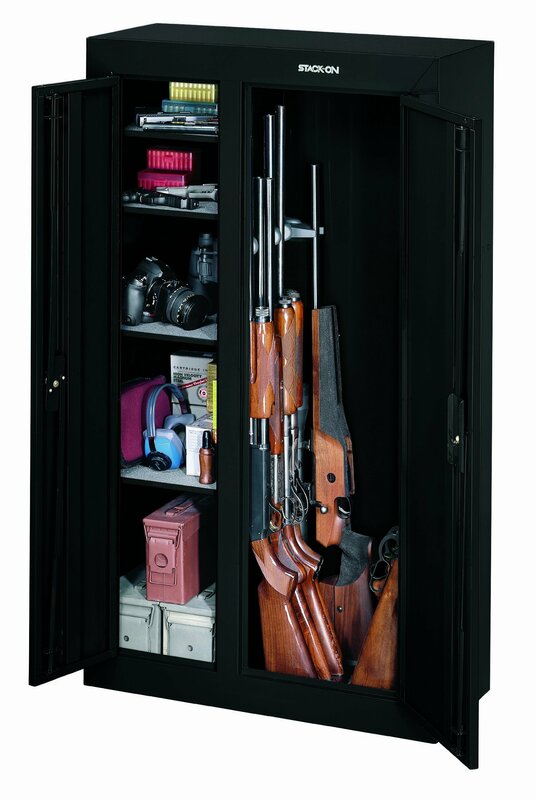 Many people who own guns for personal protection stick to handguns and, when it comes to security, there is plenty of variety when choosing a gun safe. But what about those of us who own long guns? Is there a safe and affordable way for us to secure our guns away from children and thieves? Actually, there is. This cabinet is designed with the owner of long guns in mind. Like many gun safes, the GCDB-924 is not what is traditionally thought of as a safe. Rather, as the name states, it is a security cabinet. However, don’t let this mislead you regarding the construction of this unit. Made from steel, with reinforcement added to the steel doors, this is a very secure cabinet. Each of the two doors is keyed separately, different keys are needed, and the keys are double-bitted to reduce the ability to pick the locks. When locked, the mechanism secures each door in three places: top, bottom, and middle. The cabinet is also pre-drilled and hardware supplied for fixing to wall studs or to the floor. The unit is large, but at 115lbs empty, a prepared intruder with a dolly could carry it off. The cabinet is divided into two sections with the 19.5” wide right side being devoted to securing your long guns. Molded barrel rests allow for 10 long guns, each up to 54” in length, to be stored safely, and the foam padding on the bottom prevents damage to your rifles. But the versatility can be seen when you open the left-hand side of the cabinet. At 12.5” wide, this section also includes 4 padded and adjustable shelves. You can remove the shelves allowing storage of more long guns or you can arrange them in any configuration so that this section can hold other valuables, gun related or not: ammunition, accessories, jewelry, cameras, etc. Upon arrival, the cabinet does require a little assembly in that the shelves need to be installed and some of the padding needs to secured, but this is not difficult. The positives identified were solid construction for the price and ease of assembly, and it is worth noting that the negatives were nothing to do with the cabinet itself. Rather, the complaints focused on problems with shipping. If you are looking for an affordable way to secure and store your rifles or shotguns, this is a strong contender. It is worth noting that even though negative reviews were to do with shipping rather than the cabinet itself, the more recent reviews indicate that the manufacturer may have got the message and improved in this area. But these problems shouldn’t take away from the positives that this cabinet offers. Versatility and security. And there are no electronics to fail.